Did someone forget to turn the sink off? One of the most common sources of water damage in a home are sink overflows from a sink being left on. A common scenario is a child playing in the bathroom, putting something in the sink and causing the drain to clog, or someone simply forgetting to turn the faucet off. These occurences can happen often and at Dalworth Restoration, we understand that not everyone has the time to fix an overflowing sink. Our customer service representatives are standing by 24/7 to take your call and dispatch one of our professional technicians to your home or business in our Dallas/Fort Worth Service Area. Call us now at 817-203-2944. With nearly 40 years' experience in water damage restoration, you can trust in Dalworth Restoration to get the job done fast and right the first time. We stand behind and guarantee every job we do. Start to finish. 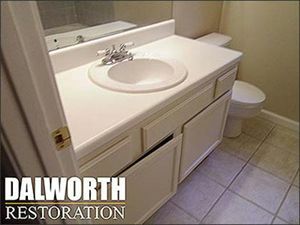 Dalworth Restoration repairs and cleans up water damage from leaky pipes, burst pipes & frozen pipes, and cleans up water damage from drain, sink, and toilet overflows and water heater bursts. Our expert water clean up technicians are certified through the Institute of Inspection, Cleaning and Restoration Certification (IICRC). 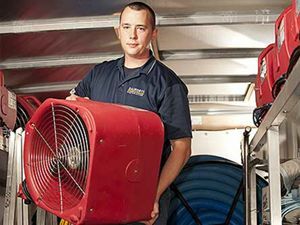 Contact Dalworth Restoration for residential and commercial water damage restoration and plumbing and appliance water overflow cleanup services in our Dallas/Fort Worth Service Area. Dalworth Restoration's Emergency Response Teams have the expertise, training, and equipment needed for: sink overflow, clogged drain and water damage restoration. Contact Dalworth Restoration's 24/7 Emergency Hotline at 817-203-2944 and we will dispatch our experienced technicians to fix your frozen pipes and burst pipes. Our technicians are certified through the Institute of Inspection, Cleaning and Restoration Certification (IICRC). Contact Dalworth Restoration for professional plumbing overflow services and water damage restoration services in Dallas, Fort Worth, Arlington, Grapevine, Bedford, Euless, Hurst, Keller or any other city in our North Texas Service Area. Reg Martin, ARLINGTON, TX, Nov 28th, 2014: "I am impressed with your service and the cost. Excellent all around."